Well its been a little while since I have updated this blog, but there has been a flurry of activity recently with a number of projects all happening at the same time – the weather gets a little colder and people start thinking again of how to improve the comfort of their house. One of these projects is progressing along as we speak, but stage 1 is complete – a newly insulated main roof, cavity wall insulation and a new warm roof above an existing extension with what will be a beautiful grass meadow roof. 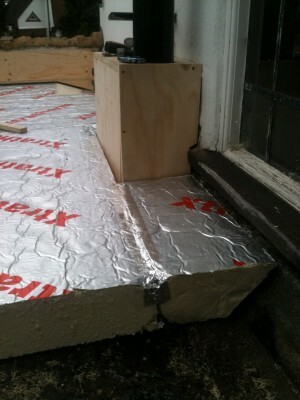 First of all it is important to check that the structure of the roof is able to support the new weight of the insulation and the ballast/soil needed for a grass roof (especially when its wet), so any sensible installer will insist on a structural report from an engineer. 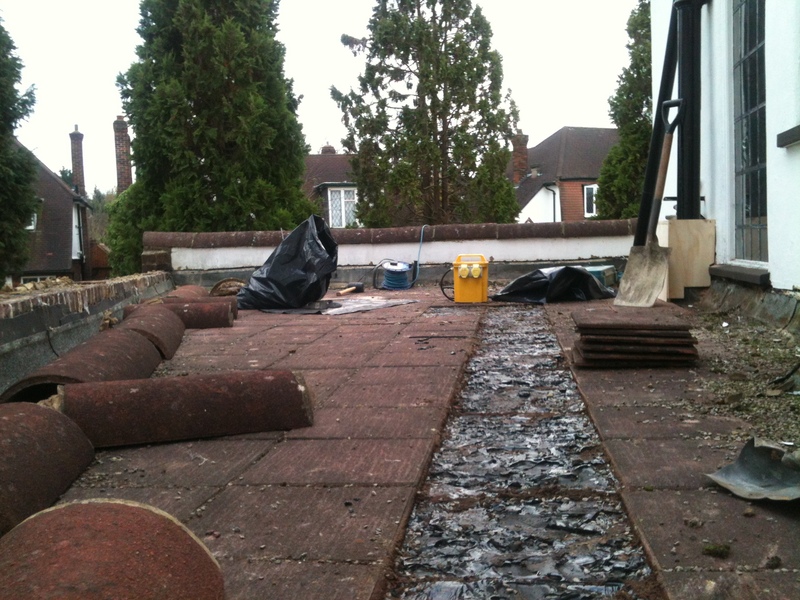 In this case we had this confirmed, and as a precaution it was decided to remove the existing tiles on the roof. The next stage is to add 100mm of Polyisocyanurate insulation (PIR) which has a K value of 0.022W/mK and offers a high performance insulation which is BRE Green Guide rated A+, and takes the U value of the flat roof from a poorly performing U= 0.6W/m2K to a well insulated U= 0.16W/m2K. This is slightly complicated by the downpipes and wast pipes that run down through this flat roof, but with some careful detailing this is resolved. 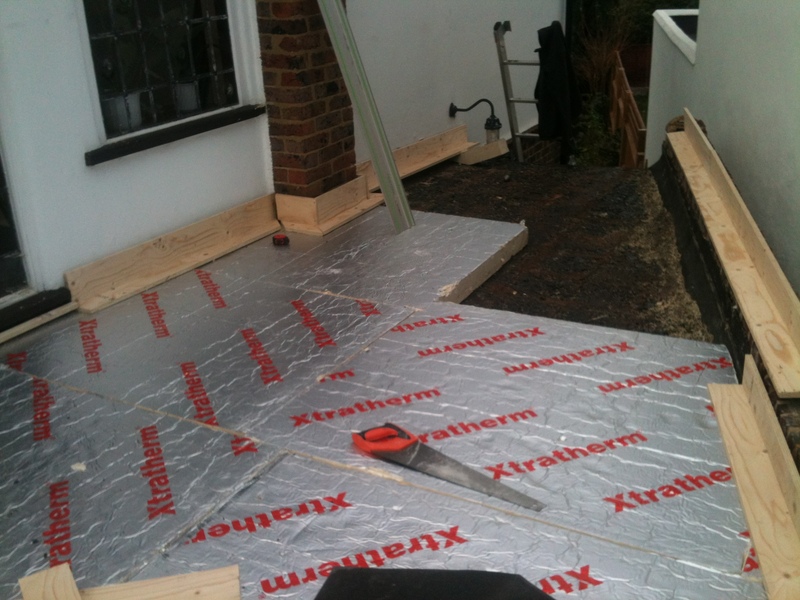 This process creates a ‘warm roof’ where the structure of the roof becomes protected by the insulation, and so maintains a more stable temperature throughout the year, and protects it from mechanical damage. The next stage is to add an EPDM – a rubberized covering to maintain the weatherproofing of the roof – this material is product guaranteed for 25 years, and by adding the grass roof on top it has been shown to last far longer by protecting it from the variations in temperature, exposure to UV etc. that a normal roof covering would have to cope with. 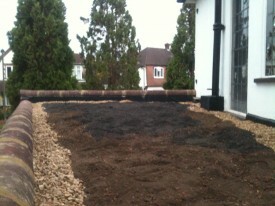 moving the balast and soil up onto the roof is one of the least pleasant jobs, but saves on a gym membership! On top of that goes a geotextile root barrier layer, and then comes the unenviable job of shifting all the substrate and ballast up onto the roof, and then spreading this out across the roof completes the basis for what will be a beautiful summer meadow. 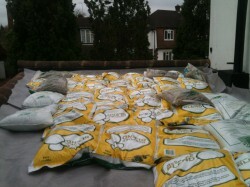 Our specialist installation partner Organic Roofs – www.organicroofs.co.uk – will come back in the Spring to complete the planting to increase local biodiversity and create an aesthetically beautiful roof, and this way our clients get the benefit of the insulation over the worst of the winter! 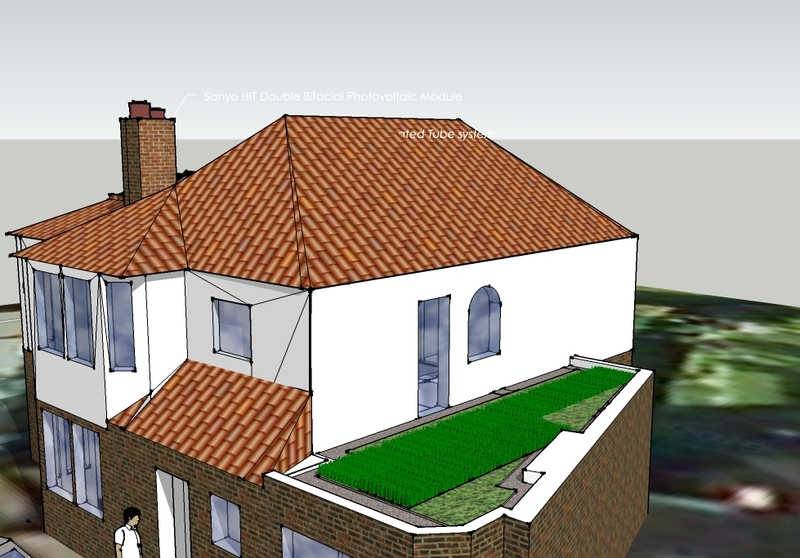 There is more information on the benefits of grass roofs by clicking here and watching the Organic Roofs video.